Snowflakes, candy canes, Christmas trees, Santa …and bogs??? When thinking of the winter festive season, one may not readily picture images of a bog, but that was the inspiration for Bog•Water – the winter seasonal beer from BEAU’S All Natural Brewing Co. In designing the beer, BEAU’S wanted to conjure up the emotions of a solitary winter walk at dusk through the Alfred Bog, a truly unique feature of Eastern Ontario The result is Bog•Water – a unique beer style we can claim is truly our own … an Eastern Ontario Gruit. 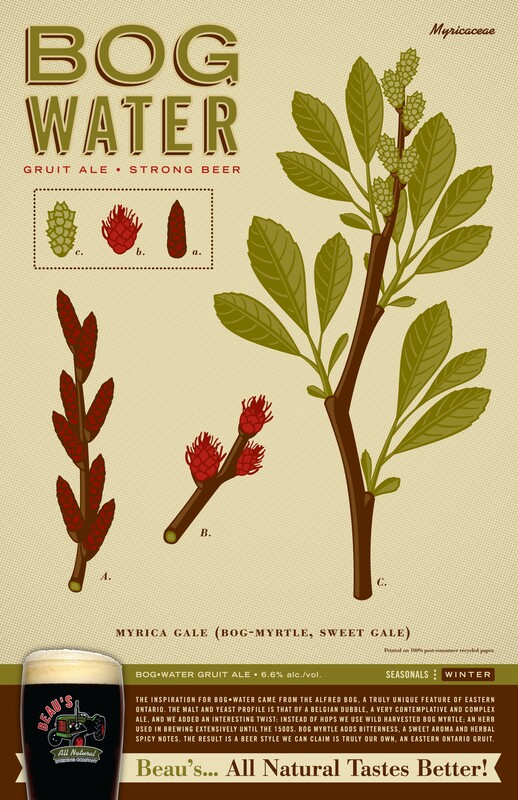 The malt and yeast profile of Bog•Water is that of a Belgian Dubble, a very contemplative and complex ale, with an added and interesting twist … instead of hops, BEAU’S uses a wild harvested herb known as bog myrtle, which was used in brewing extensively until the 1500s. In the years before the Bavarian Purity Act of 1516, many herbs and spices were used to flavour and preserve beer. 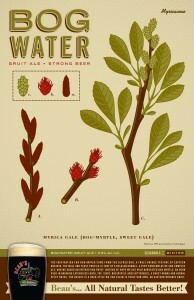 Bog myrtle and hops were two of the most dominant herbs. In fact, bog myrtle was so extensively used that in parts of Europe you could even pay your taxes with it! With the introduction the Act, came the unfortunate consequence of destroying many excellent interpretations of beer that used herbs other than hops and because of this, there are no longer any recognized styles or recipes for a brewer to rely on for reference. Harvested by an Algonquin native from the wilds of northern Quebec, BEAU’S uses the entire bog myrtle plant as each portion adds to the brews distinct flavour and aroma – strong herbal tones coming from the branch, bitterness from the leaf and the cone providing a peppery spice. All working together to provide a malty, plum-like fruitiness that is offset by spicy, earthy bitterness and pairs great with foods like Roquefort cheese, Kielbasa or even a banana split. 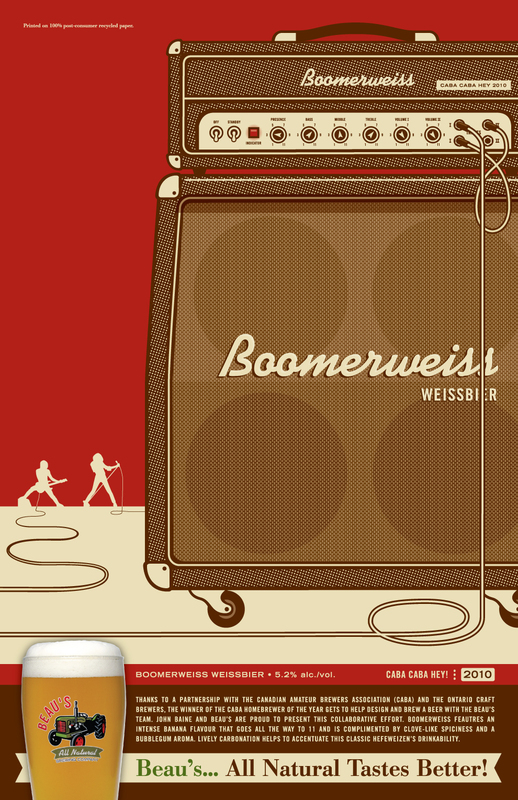 BEAU’S All Natural Brewing Co. Is proud to present the 2010 edition of its CABA CABA HEY series of beers “Boomerweiss Weissbier” a collaborative effort from BEAU’S and ‘Home Brewer Of The Year’ John Baine from Dundas, Ont. Thanks to this unique partnership between the Canadian Amateur Brewers Association (CABA) & Ontario Craft Brewers, the Home Brewer Of The Year not only gets an award and bragging rights, but also gets to help design & brew a beer with the folks at BEAU’S. 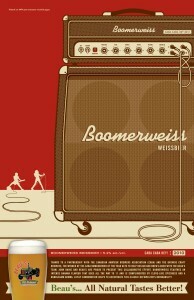 John’s award winning entry is called “Boomerweiss Weissbier”. A beer that features an intense banana flavour that goes all the way to 11 and is complimented by clove-like spiciness and a bubblegum aroma. Lively carbonation helps to accentuate this classic hefeweizen’s drinkability.